Kanye West’s Twitter feed has become a constant source of entertainment on the internet. His twitter go from random to ridiculous (to possibly genius). On Monday now the crooner Josh Groban sat down on “Jimmy Kimmel Live” to perform his interpretation of the twitter. 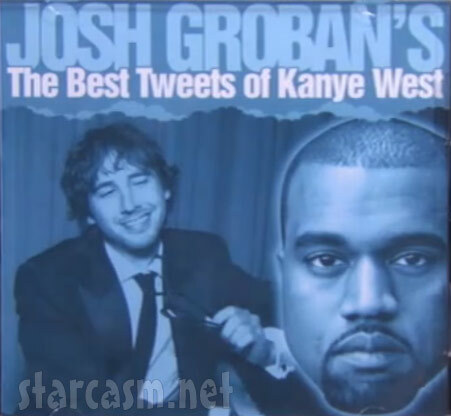 Groban said “If you love Kanye West's tweets as much as I do, then you're going to love my new album, Josh Groban's ‘The Best Tweets Of Kanye West’." - “Do you know where to find marble conference tables? I'm looking to have a conference... not until I get the table though." - "Fur pillows are actually hard to sleep on." - "Man... whatever happened to my antique fish tank?" Previously Kanye West said that he likes using the micro-blogging site to communicate with his fans. He finds Twitter much easier than interviews. West said “They just set 'em up wrong. I couldn't communicate and now I can communicate just in a sound bite and give people a glimpse of everything. It's good."